Texting is the dominant medium for communicating today. And while institutions across the country are benefiting from using SMS texting platforms for enrollment and engagement, the medium is currently underutilized in advancement. Texting alumni and donors can be a game-changer if done correctly. 1. Reach out to current students and graduating students. Your “Alumni in residence,” if you will. Whether students already have a texting relationship with your institution or not, it is a good first step to send out end-of-semester and graduation information to lay the groundwork for communications down the road. Congrats <FIRST NAME>! Welcome to the <School Name> alumni family. Stay connected by joining our alumni network, and let us know what types of communications you'd like to receive here: <URL>. Feel free to text this number any time! Via the provided link, allow new grads to indicate their texting preferences (i.e. updates from athletics, alumni/ chapter events, or fundraiser initiatives). Highlight the benefits on the page and let alumni know exactly how you intend to text them so they won’t view your correspondence as spam. For very recent graduates, 1-2 years out, establish a texting relationship with a welcome message that extols the benefits of being an alumnus. Again, let your contacts indicate their texting preferences so they are only receiving messages they value. By drawing upon their unique interests, you can tailor their message, increase their engagement, and reduce opt-outs. Hi <FIRST NAME>, this is Amber, President of the <School Name> Alumni Association. 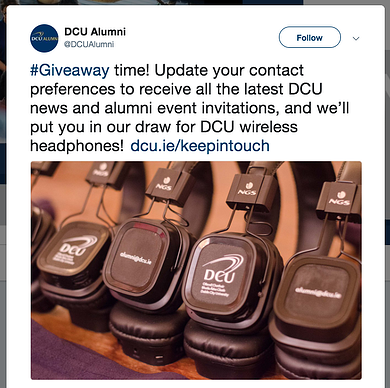 We are here to help you stay connected to your alma mater. Do you prefer to get texts about events, giving opportunities, and campus happenings? Text us at this number any time or update your preferences here: <URL>. Be sure to incorporate other mediums of your communications strategy. For instance, send an email in addition to your text to ensure that you reach grads for whom you have no mobile number. Make your communications preference page clearly visible and accessible to all alumni who visit your site. The idea is to allow alumni to indicate their communication preferences at a granular level. This will allow you to customize who receives which communication method (and what content) and when they will receive it. Consider a more selective strategy that only calls/texts/emails alumni when it’s highly relevant to their interests. You may start by asking those who pledge during a phonathon or online if they would like to receive pledge reminders and other notifications via text. Include the option on all event registration forms, donation pages, and within other communication like email and social media posts. But how else will you decide who to text? Of course, avoid texting contacts who are already coded as “do not phone,” "do not contact," “do not email,” etc., as they are not likely to want texts. Perhaps decide to focus on alumni who graduated no earlier than a certain graduation year. No matter what you do, make sure the text you send is relevant to each and every recipient. You don't want to send a Denver Chapter event notification to those in Detroit. At Mongoose we are happy to help our clients define their strategy for alumni outreach. Most schools have found it effective to send an introductory message and politely let them know they have the option to not receive more text messages. 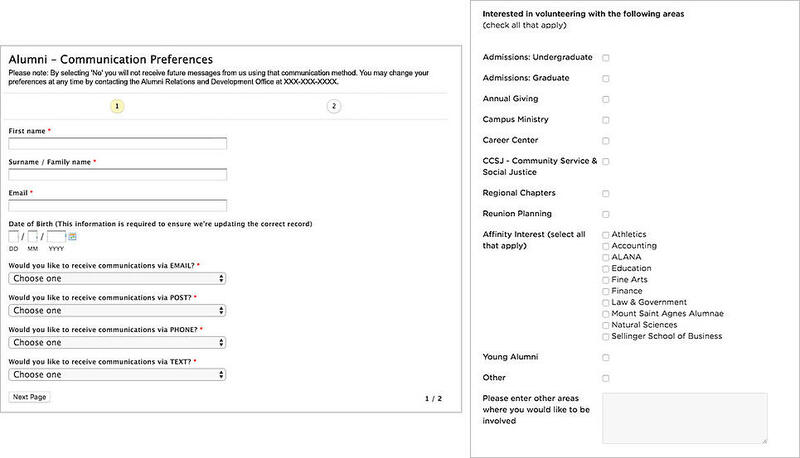 Ideally, you should send a link to a form where alumni can customize the types of messages they would like to receive. Hi <FIRST NAME> this is Mike from <School Name> Alumni Relations. As a Theatre major, I wanted to let you know about an alumni event coming up at our local theatre. Would you be interested in learning more? Please let me know if you prefer not to receive texts. While texting is effective for Giving Day, we recommend sending at least 3-6 non-fundraising messages to your contacts over a significant period of time before asking for their support. Once you’ve engaged alumni via text, prepare for your Giving Day! Be sure to craft messages that are conversational and engaging, not overly formal and robotic. Help students fulfill their dreams of changing the world by supporting the <Scholarship Name>. Give now to <School Name>. Text 12345 to donate today! Hi <FIRST NAME> this is Megan Smith '03 from <School Name>. I volunteered to help with this year’s Giving Day because of the impact scholarships had on my life as a student and I want to give others the same opportunity. If we get 10 more donors by 3pm, Dr. Santorini has pledged to contribute another $1,000! Will you join me with a gift to the scholarship fund today? No gift is too small! As effective as texting can be for fundraising and event promotion, it’s important not to overlook how powerful texting can be for timely and personalized stewardship. Hi <FIRST NAME>, Mike from <School Name> here! As a supporter of the Physical Therapy Study Abroad Scholarship we couldn't wait to share this with you! Becca Smith '21 just returned from the D.R. with her classmates. She says without significant scholarship support she would not have been able to participate in this life and career-changing experience. Read more about her trip and your impact here <URL>. Hi <FIRST NAME>, Lauren, from Dean Brown's office here at <School Name>! I'll be meeting with alumni in Boston next Thursday and Friday and I was hoping to take you to lunch to say thank you for your ongoing support. Are you free either day? How often does a phonathon conversation end with a statement like this: “I’ll make a pledge, but send me something in the mail or email me”? When that happens, offer to that person (and those who’ve made a specific pledge) an immediate text with more information. Ruffalo Noel Levitz followed four schools who used texting for pledge fulfillment for just two weeks and found institutions were able to increase their pledge fulfillment by nearly 3%, on average! Communicating with alumni may seem like the final frontier as far as texting in higher ed, but it doesn't have to be a perilous journey. In these highly personal exchanges, your message should never reveal that you are using software. During the course of your text or in-person conversations, if they indicate they’d rather not get text messages from you, be sure to opt them out. Be sure the texting platform, as well as your CRM are coordinated so that opt-ins and opt-outs can be recorded and respected with ease. Also, as stated above, always support your text messages with other communication channels, like social media, phone calls, and emails. Texting is a powerful tool, but shouldn’t be treated as an “all-in-one” tool. Mix it in with other methods that have proved effective for reaching alumni.